Gary Roland, owner of Beach entertainment and Talent, is also the lead singer/ guitarist for the world famous band, The Landsharks. Gary Roland has been a Talent agent for over 10 years. He has booked bands in Disney, Universal Studios, at the Super Bowl, for the NFL, NBC Television, Microsoft, Apple, Ford, Toyota, and too many other great companies and venues to mention! Gary is also the owner, lead singer/lead guitarist, for "Gary Roland and The Landsharks Band." Gary has played with, backed up, and opened up for Jimmy Buffett, in concert, and at Margaritaville, and also, opened up for The Beach Boys, in concert, played The Super Bowl, and traveled the world, performing and coordinating events, shows, concerts, and more! Gary Roland and Landsharks, with special guest, Jimmy Buffett, at Margaritaville. BELOW: Gary Roland (Right) with Mike Love, lead singer for The Beach Boys, Backstage at the Beach Boys/ Landsharks concert in Kitty Hawk, North Carolina celebrating the 100 year First Flight Centennial, an event that was attended by the President Of The United States. ......We books all styles and types of music, and all types of events! FOR BAND PRICING: CLICK HERE! 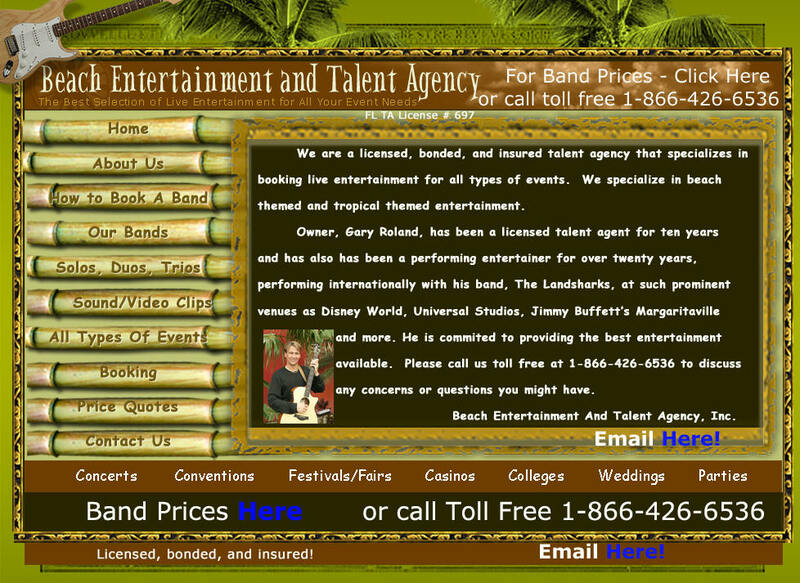 Beach Entertainment And Talent has bands for Concerts, Festivals, Fairs, Conventions, Weddings, Parties, and more. We book only top-quality bands. We are a licensed and bonded talent agency that provide the best in bands and other live entertainment. We specialize in beach bands, island bands, tropical bands, reggae bands, Jimmy Buffett Bands, tribute bands, Beach Boys Tribute bands, beach music bands, and more. Beach Entertainment &Talent Agency books only quality bands and live entertainment. We specialize in Beach Bands and tropical style entertainment, but we also book all styles and types of music, bands, and entertainers. Our featured act, The Landsharks Band, has performed at thousands of events, at major venues, all over the world, including at events in Disney World, Universal Studios, Margaritaville, at Ritz Carltons, and even at The Super Bowl! Beach Entertainment and Talent books bands for all events including concerts, conventions, parties, weddings, private events, and more. Our bands specialize in performing at beach events, everywhere! We have Tribute Bands, including Jimmy Buffett Tribute Bands, Beach Boys Tribute Bands, Eagles Tribute Bands, Beatles Tribute bands, Queen Tribute Bands, Pink Floyd Tribute Bands, and more. We also have beach themed bands including calypso bands, steel drummers, surf bands, Buffett Bands, Beach Bands, Beach Music Bands, and more. Our Bands have performed at some of the finest destination weddings, at beach wedding venues, all over the world, including beach weddings in Disney, Universal, at Ritz Caltons, The Breakers, and more.